The Poker Room at Thunder Valley Casino Resort | Lincoln, CA: Remember 6BB Will? When Day 2 started a few hours ago, Will Chao had 6BB and was fortunate to have that much. He made it all the way to that point with a 66 > JJ catch right before the bubble burst in Day 1B. We documented an early double that pushed him to 100,000, and he's been running hot ever since. 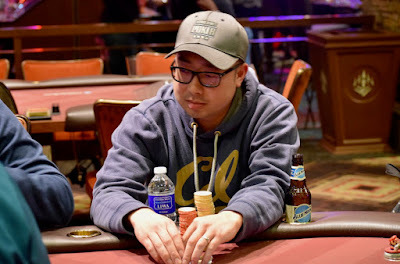 Chao just eliminated Chet Sickle in 13th place and now has 410,000. Can 6BB win this tournament???? ?